Arctic gas hydrate is a fossil resource mainly consisting of methane. It may represent a larger energy supply than all other oil and gas resources put together. But what is the potential impact of gas hydrate on climate change and the marine environment? A new Norwegian Centre of Excellence will supply valuable answers. At the Arctic University of Norway in Tromsø (UiT), the establishment of the new Centre for Arctic Gas Hydrate, Environment and Climate (CAGE) signals the start of one of the world's foremost specialist communities in basic research on gas hydrate, a resource barely heard of ten years ago. 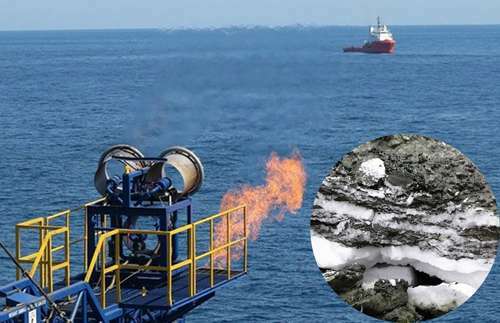 Gas hydrate contains methane trapped inside a rigid "cage" of frozen water molecules, kept stable only by sub-seabed high pressure and low temperatures. This frozen methane may be found under any ocean floor, but experts believe it is particularly abundant under the Arctic Ocean. CAGE will be carrying out pioneering research on gas hydrates. Based at the Department of Geology at UiT, the new Centre of ExcellenceSFF brings together geologists, geophysicists, geochemists, micropaleontologists, biologists, oceanographers and experts in statistical modelling. "CAGE is the only centre in the world to focus on the role of gas hydrate solely in the context of environmental and climate issues," says Professor Jürgen Mienert, director of the new centre. "We will be carrying out basic research and trying to understand everything about gas hydrate, whether far beneath the ocean floor or as greenhouse gas high in the atmosphere." "If large-scale recovery of gas hydrate becomes feasible our research will certainly be applied as well. We are already working with the international Norwegian energy company Statoil and other important commercial actors who are following our progress closely." Climate change is warming the atmosphere and oceans alike, and Arctic waters in particular are heating up. So the stability of these sub-seabed gas hydrate deposits under the world's warming oceans may be a critical factor for understanding climate change. Methane released into the atmosphere has an even more potent greenhouse effect than CO2. The gas lasts roughly a decade in the atmosphere. Gas hydrate can form under coastal waters, under permafrost on land, or under deep-ocean water masses. There have been findings both on the seabed and beneath it. Gas hydrate exists down to 1 000 metres beneath the seabed. The stability of these deposits is dependent on high pressure and low temperatures. If climate change continues warming the oceans, the methane-containing ice in shallow waters may begin to melt, releasing large amounts of methane into the atmosphere. CAGE researchers will be studying whether this is already happening and whether it is likely to increase in the future. Research on this new frontier is now yielding important knowledge for future decisions. Gas hydrate accumulates under the seabed in places where methane-producing bacteria exist. The methane may also originate from other organic material in the deep, but a plausible theory holds that most of it arises from bacteria that can live as far down as 2 000 metres beneath the seabed. "We plan to measure marine methane emissions and identify where under the ocean the gas hydrate deposits are found," says the SFF centre director. This will be done by CAGE geologists together with the centre's main partner, the Geological Survey of Norway (NGU) in Trondheim, through its MAREANO programme for seismic mapping of the seabed off Norway. Roughly 60 per cent of atmospheric methane comes from anthropogenic sources such as agriculture, animal husbandry and the combustion of coal, oil and gas. In recent years the concentration of atmospheric methane has increased, but it is not known whether this is due to increased emissions stemming from frozen methane. As the climate warms it is critical to understand the behaviour of marine gas hydrate and the Arctic permafrost. "Methane emissions also contribute to lower pH levels in the world's oceans," continues Professor Mienert. "This is in addition to the acidification resulting from more CO2 accumulating in the oceans. But very little is known about methane's role in acidifying the oceans. This is something we hope to help answer. A research pioneer in this field, Dr Giuliana Panieri from Italy, has now joined our staff at CAGE." The Tromsø-based centre is collaborating with researchers from a variety of countries, including Canada, Russia and the USA. Together with the Canadian and US researchers, the centre is taking the initiative to conduct experimental drilling for methane in the Arctic. The new Norwegian ice-going research vessel Kronprins Haakon, to be launched in 2015/2016 and based in Tromsø, will be a valuable infrastructure platform for the CAGE researchers. Newly developed in-situ sensor technology measures dynamic processes in real time at resolutions impossible only a few years ago, and increasingly advanced laboratory equipment on the research vessel will be valuable as well. "The Research will reach from the Kara Sea north of Russia to the open seas of the North Atlantic," quips the director.